At Bez Law Firm, P.C., we know that our clients come to our Sacramento divorce lawyers during uncertain and troubling times. Whether you need counsel for divorce, custody and visitation, domestic violence, or another type of family law case, you can rely on a Sacramento divorce attorney from our firm to guide you through the process ahead. We have dedicated our professional careers to helping families move forward to a more positive future. Whenever possible, our divorce lawyers in Sacramento are committed to helping people work through conflicts to pursue an amicable resolution. Known for our straightforward approach, we have been able to help clients reach satisfactory results in even the most complex matters related to divorce, including international custody. Recently, we successfully petitioned Superior Court for the immediate return of children to their home state in Canada under the Hague Convention. Whatever matter of family law you need to resolve, a Sacramento divorce attorney from our firm can clear up the legalese and help you navigate the court system with ease. Turn to Bez Law Firm, P.C. for the honest advice and dedicated representation you deserve. We will be your advocates every step of the way. Call (916) 512-8944 to speak with a Sacramento divorce lawyer. 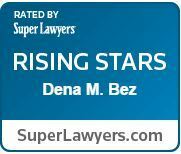 Attorney Dena M. Bez is an experienced Sacramento divorce lawyer. She dedicated her legal career to helping families who face uncertain and difficult times. Her straightforward approach means that she will tell you the truth, even when it doesn’t benefit her firm. She is committed to helping families protect their futures and the futures of their children, providing the clear and honest counsel they need to take the best course of action and move forward. Why Choose Our Sacramento Family Lawyers? “From start to finish, they were organized, professional, extremely efficient, and assuring. I could not have asked for a more satisfying outcome and experience.” – Joyce C.